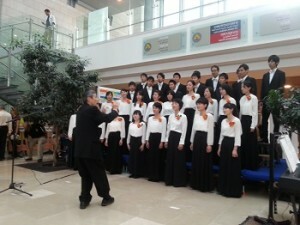 The forty young Japanese singers stood in the Sarah Wetsman Davidson Hospital Tower atrium, filling it with music and drawing patients, doctors and nurses to the harmonious sound. Classical music and Israeli favorites made up the wide repertoire. But when soloist Taiki Hino began singing My Yiddishe Mama in Yiddish, even those walking purposely to appointments and treatments had to halt in their places. The Netzer Choir, a group of men and women mostly in their twenties, were visiting Israel to show their love and appreciation of the Jewish people and the State of Israel. They are an outreach of Japan’s Beit Shalom and have clubs all over the country. Favorites with the audience included Eli, Eli, the Eucalyptus Grove, Song of Peace and Al Kol Aleh, (on all these things). They ended their performance with Jerusalem of Gold and the prayer written by Nobel Prize winner Shmuel Yosef Agnon for the Welfare of the State of Israel. 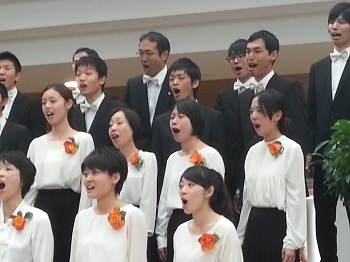 Members of the choir were visibly weeping with emotion to be singing these songs in Jerusalem.